Feet can take a pounding in the workplace. Protection, safety, correct shoe type and correct shoe fit is the only thing standing between you and injury. For a trades person, few things are more important than having the right equipment for the job. The right equipment means a job can be done well, efficiently and correctly. A good pair of work shoes are no less important. Good work shoes protect your feet from injury, prevent falls and slips and allow you to stand, climb and jump off machinery all day without foot pain and fatigue. As well as the all too common toenail trauma and pressure lesions. All these conditions will result in a loss of productivity. Orthotic therapy plays an important role in preventing and rehabilitating injuries. If there is a deficit in alignment, muscles and ligaments are put under greater strain, which results in fatigue, pain and injury. Orthotics need to be made to suit the workplace activity, be it a lighter material, a robust top cover or the addition of closed cell padding to reduce friction. Choosing the right boot can be challenging. It is of course important to be familiar with your workplace requirements regarding specific features. Some workplaces insist on a steel cap, whereas others call for a safety cap. Steel caps are generally heavier, whereas polymer safety toes are lighter, don’t tend to damage toenails as frequently and are a good option if you work in cold rooms. Outer sole material should also be considered. A polyurethane sole tends to be better in oily environments whereas rubber soles tend to be better in soil and uneven terrain. If your job puts stress on your ankles, it is sometimes more beneficial to have a boot which extends higher up your ankle. It is also beneficial to make sure your boot has a removable inner sole. This will not only make cleaning and hygiene easier to manage, it provides room for replacement inner soles, on shoe padding or orthotics if required. The most critical feature of any workplace boot is fit. Boots and shoes can have all the safety features correct, however if they are too tight, impinge on the mid foot or narrow, your will develop foot pain, metatarsalgia, neuromas or pressure lesions. 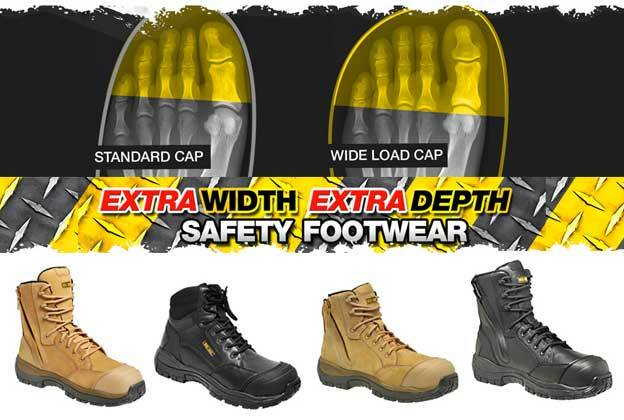 At Hinkler Podiatry, our team see lots of foot problems caused by narrow safety footwear. Which is why we now stock Wide Load Safety Footwear. The Wide Load range is designed specially for the Australian wide foot, featuring the widest profile non metallic protective toecap on the market. The range also features airport friendly “stealth” range, which allows you to pass through security without having the inconvenience of removing your shoes. Don’t wait for injury to stop you from earning a living. Make a good investment in your health and speak to the experienced and professional team at Hinkler Podiatry about choosing the best workplace shoes for you.